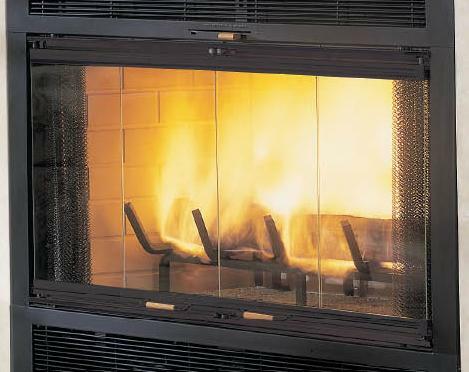 Fireplace or Wood Stove Glass - Rocklin Glass & Mirror, Inc. Rocklin Glass & Mirror, Inc. Fireplace or Wood Stove Glass - Rocklin Glass & Mirror, Inc.
Rocklin Glass & Mirror, Inc.
Fireplace glass is heat tempered glass, due to its mechanical strength. Wood Stove glass is a ceramic glass. We sell both. Fireplace glass, tempered glass, is used in fireplace doors. This type of glass is designed and made to withstand heat to about 400 Degrees Fahrenheit. Tempered glass is not recommended for wood stoves; pellet stoves or coal burning stoves because the temperatures get extreme in them. However, NeoCeram ceramic glass can tolerate extreme temperatures. Tempering not only strengths glass through a chemical or thermal process, but it also changes its breakage pattern; which causes the glass to shatter into very small pebble pieces instead of large shards, reducing the chance of injury. It is best suitable where fire will not be touching the glass, as a constant temperature of 500 plus degrees causing the glass to weaken or shatter. We can order fireplace glass, custom made to your exact specifications to fit your fireplace doors. Tempered glass is heat treated for strength and processed which is why it must be special ordered. Typically once we place an order it takes 2-3 business days to receive it. Once we get it, we promptly call you to pick it up. NeoCeram ceramic glass can withstand temperatures of extreme heat as high as 2000 Degrees Fahrenheit, recommended at short intervals. This allows the wood stove to heat a room at maximal efficiency. NeoCeram is the optimal choice for wood burning stoves. We carry NeoCeram ceramic glass in the shop. Ceramic glass is sold under various names such as NeoCeram, PyroCeram and Robax. These are brand names of heat resistant ceramic glass that is suitable for wood stoves, wood pellet stoves and/or coal burning stoves. They are a transparent ceramic that withstands extreme heat. Give us a call to help you with your fireplace, wood burning stove, pellet stove and/or coal burning stove glass needs today.